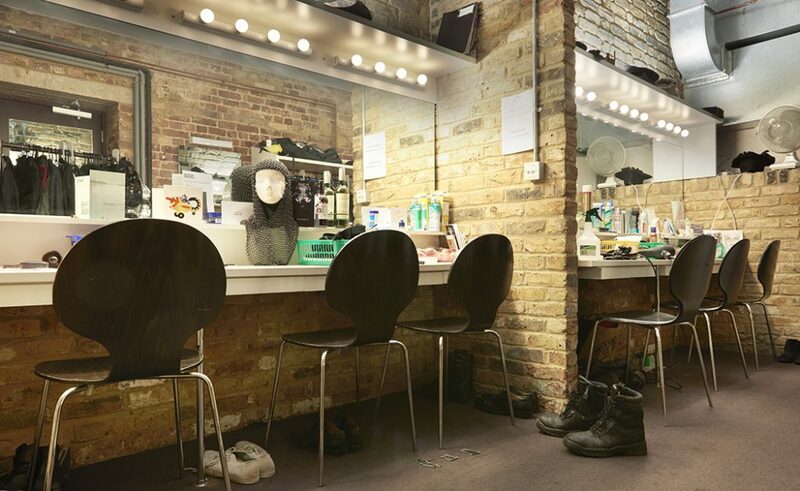 Michael Coveney, a theatre reviewer for 45 years, and Peter Dazeley, an award-winning photographer, have come together to celebrate London theatres. Both are Londoners with extensive knowledge on the subject and were granted access to areas of the theatres we would not get to see otherwise. I’m always astounded how ornate so many London theatres are both inside and out. And how we often take this for granted. 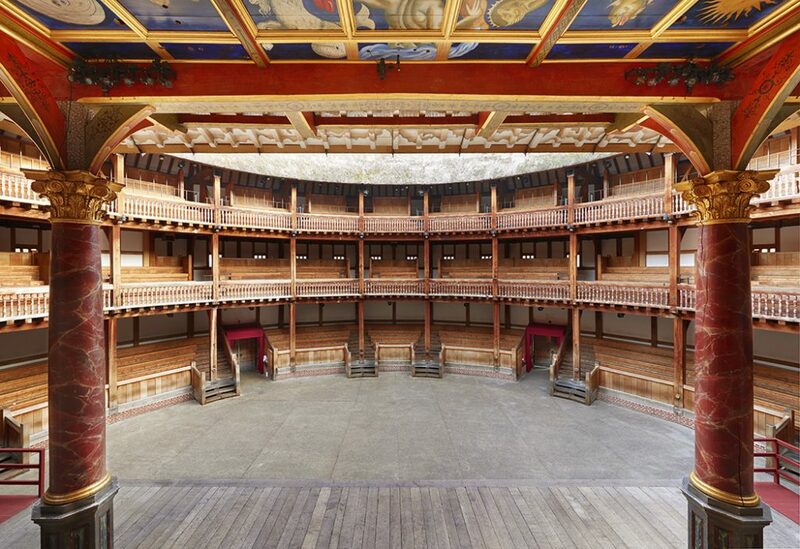 London theatres are not just venues to watch a performance yet, with photography usually prohibited, we can’t record the grandeur. 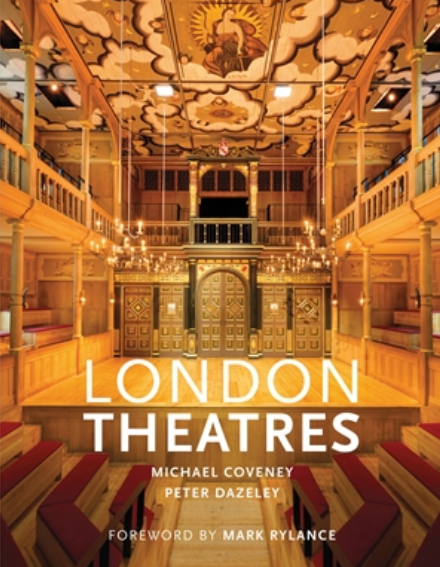 This book looks in detail at forty-six of London’s theatres, not all in the West End. Of course, this isn’t all of the theatres in the capital but it does give an excellent insight into London’s theatre world. It has stories of the architecture, people and productions with stunning photographs of the auditoriums, public areas and backstage. Even the most regular theatre-goer will find things in this book that they’ve never noticed. 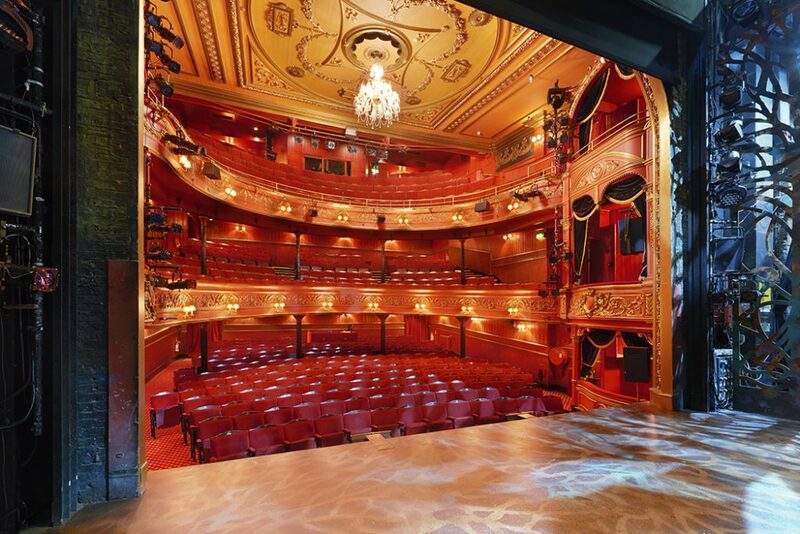 Did you know that Theatre Royal Drury Lane has an unexploded bomb on display? And speaking of bombs, did you know that the angel, Laetitia, on top of the New Wimbledon Theatre was removed in wartime in case she was used as a landmark to guide German pilots? 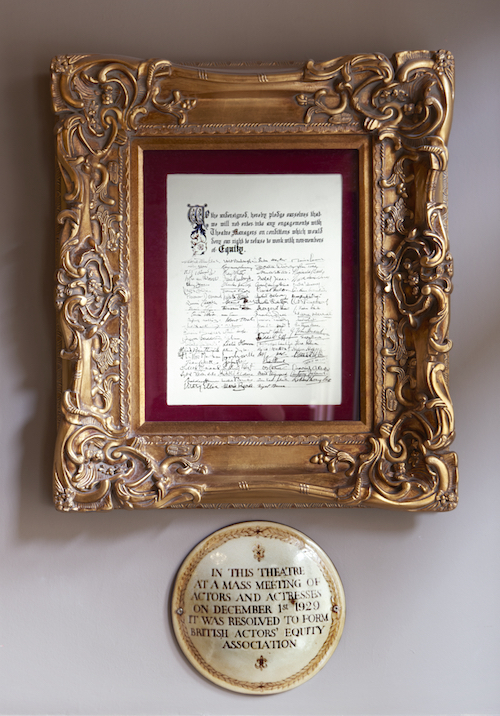 And the Circle Bar at the Duke of York’s has the original document signed by actors at the formation of Equity in 1929. I didn’t know that. They asked the acclaimed actor and theatre director Mark Rylance to write a few words for the book’s Foreward. He has written a wonderfully resonant couple of pages that really set the scene as he describes the interaction between the actor and the theatre space. Who reads a coffee table book from cover to cover? I agree, that’s generally not the aim of such a beautifully presented tome but once I had studied the photographs I wanted to know more. And what I found was that this illustrated overview of London’s theatres was surprisingly readable. And that the information included was as fascinating as the glorious photos. 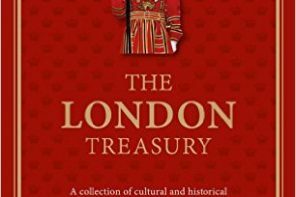 This is the third book from Peter Dazeley (Unseen London published in 2014, revised 2017 and London Uncovered in 2016). Each is the same heavyweight size and a joy to flick through or study in-depth. The book tells a tale of evolution and regeneration in the West End and how we have learned to love live performance again. There was a time not so long ago when we could have lost London’s theatreland (a term first used on a London Underground poster in 1915). 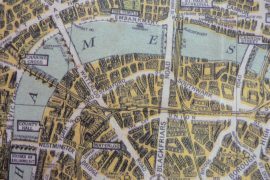 In 1972, the Greater London Council planned to redevelop Covent Garden, threatening sixteen theatres. Following the Save London Theatres Campaign, the Theatres Trust was founded in 1976. 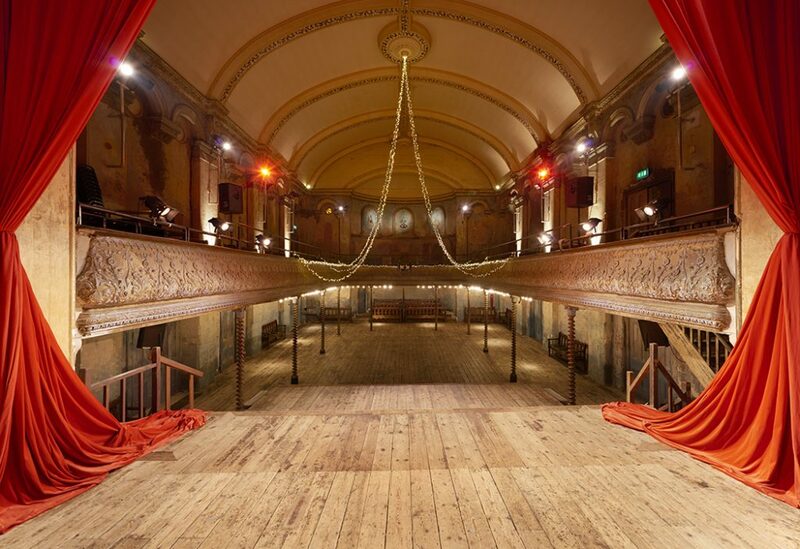 That, in turn, led to the Grade II listing of many more theatres, ensuring their future. 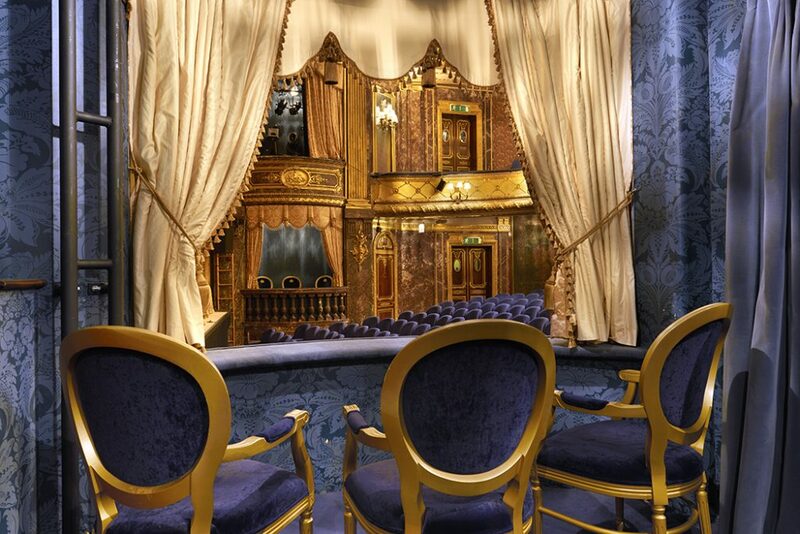 A trip to the theatre is normally spent looking at the stage so you may not notice the detail of the venue. I try to always look around me but I’ve found these photos are often better than actually being there. Seriously, places I know well have been brought to life by being able to admire them more closely. The shape of the dress circle at Theatre Royal Stratford East becomes obvious (a horseshoe). Coupled with the informative commentary I now know this Frank Matcham-designed theatre, has a stage depth of 38 feet making it one of the deepest in London. And that the central chandelier is one of a pair with the other hung at Wyndham’s Theatre. It’s those kinds of facts that kept me wanting to read more. Another east London Frank Matcham-designed gem is the Hackney Empire that was the first all-electric theatre in the capital when it was built in 1901. I go to see the pantomime there every year but I didn’t know the balcony that seats 300 people is so alarmingly steep that it is deemed a health and safety liability where children are concerned so is closed for the pantomime season. Some photos in the book are areas we never get to see such as the view from the stage or backstage or the dressing rooms. 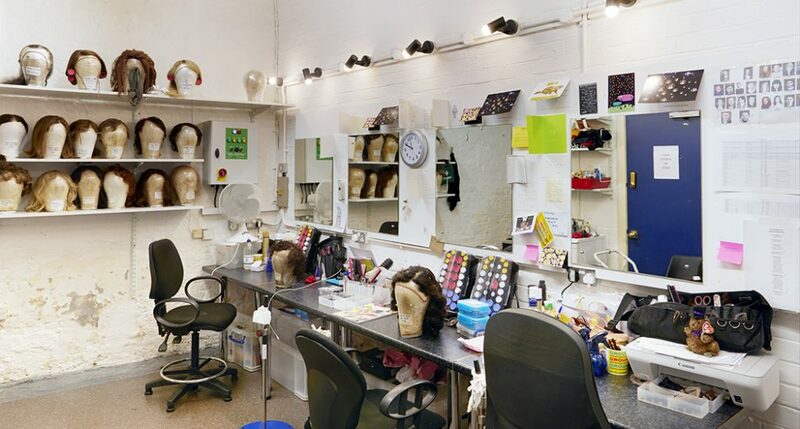 It was interesting to see that some dressing rooms have space for a bed and some simply have rails for clothes and shelves of wigs plus the obligatory mirror surrounded by lights. I think beyond the gorgeous photos I loved the quirky facts so here are some of my favourite finds. Theatre Royal Haymarket was the last theatre to serve tea on trays in the interval. There’s a pump under the stage at the Palace Theatre to keep the River Fleet at bay (I didn’t even realise the ‘lost’ river flowed near there). And there’s a ‘donkey run’ for live animals at the London Palladium. 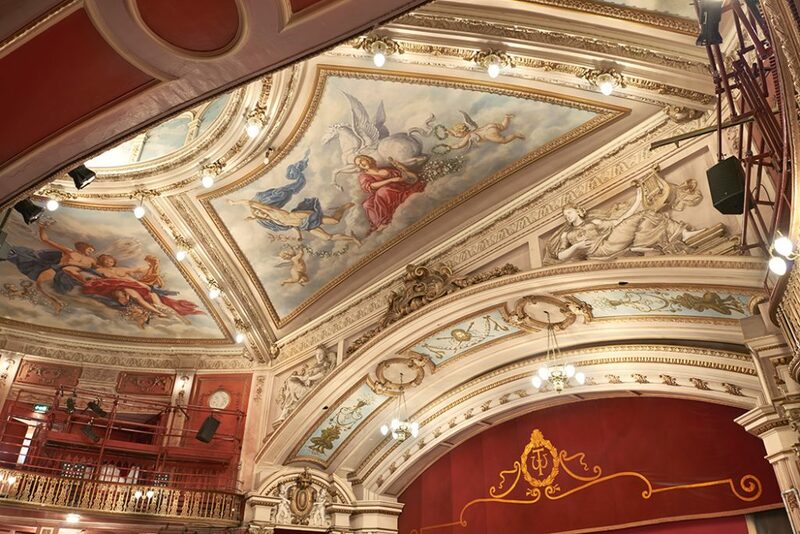 There’s a London theatre included that’s in a Victorian lecture hall, and another with a ceiling painted by TV interior designer Lawrence Llewelyn-Bowen. One has four Victorian lamp-posts identical to those on the street outside. And another was designed by the same person who was responsible for the iconic red telephone box. This is a well-researched sumptuous book with exquisite photos. The quality and consistency of Dazeley’s photographic work complements Coveney’s text perfectly. 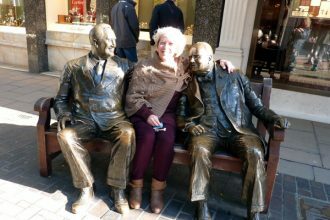 London Theatres will appeal to theatre fans, history and photographer lovers and those who simply adore finding out more about London. 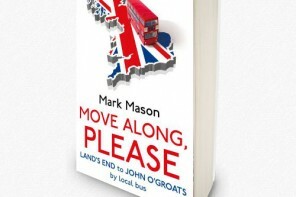 The book is available from Amazon and all good bookshops.